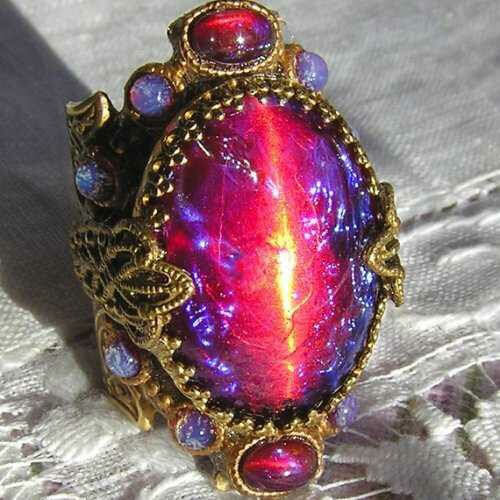 The inspiration behind this stunning polish is this Dragon's Breath Fire Opal. Isn't it gorgeous?! Some words from Mariah, the maker: As an October baby, I feel an infinity for opals, man made glass or not. Me too, and I'm not even an October baby. They're just so damn pretty, birthstone or not. Maker description: A magenta jelly filled with orange to gold to green shifting iridescent flake, glowing with blue to purple to bronze shifting shimmer. Formula: You read that right up above - just 2 easy coats for this flakie-filled jelly! I had no issues with formula. All the flakies laid flat with no extra manipulation needed, other than occasionally tapping down a stray flake or two on the tips of my nails. Very little cleanup needed as well. My thoughts: This is one beautiful, saturated, lit-from-within polish. WOW. Between the base color, the insane amount of flakies, and that glowing blue shimmer that's shown up in a couple recent GLL's, I'm in love. If my notes don't convince you, scroll down to see it with matte topcoat. These next photos were taken in a lightbox with matte topcoat to show off the flakes. I'm honestly still drooling over the matte macro. One last look at the inspiration photo next to the matte macro. Mariah captured this stone so well! You can purchase Great Lakes Lacquer "Glass on Fire" on the Polish Pickup website Jan. 5th at 11 AM EST thru Jan. 8th at midnight EST for $13. There is no cap.